Another anime season has come to an end. 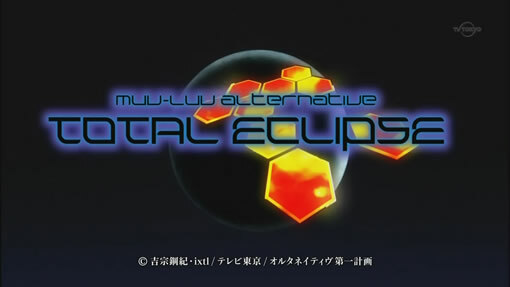 I don’t watch that much anime these days, so the only series that I’ve been watching been watching and not blogging that concluded in the season was Muv-Luv Alternative: Total Eclipse. Total Eclipse is a show about people using giant mechas to fight invading man-eating aliens. Oh and it also has pretty girls too, so it’s the type of show that I typically watch. Here are some final thoughts I have on this series. The series started off pretty well, and the first two episodes of Total Eclipse was pretty memorable for its gory deaths. Those two episodes really gave the sense that even with giant mechas, humanity is losing the war against the endless swarms of giant man-eating aliens called Betas. Given the start, I was expecting the rest of the series to be about the main characters fighting hard battles, making tough choices and trying to stay alive in a world that’s being overrun by the ravenous aliens. However, that wasn’t really the case. Instead, Total Eclipse was focused on teams of military test pilots and their support crew who are trying to develop the latest and greatest mecha for fighting off the Betas. For most of the series, the Betas are only mentioned and take a back seat to the various other happenings at the weapons testing facility. These include our main test pilot Yuuya getting the attention (affectionate or otherwise) from the various attractive female officers and test pilots from other teams, teams having mock battles against one another and the scheming and plotting between different organizations. Even when faced against possible annihilation against an overwhelming enemy such as the Betas, in Total Eclipse it seems humanity is still its own worst enemy especially during the episodes when real fighting actually happens. This point held especially true when a terrorist organization appeared out of nowhere as the major threat near the end of the series. Having the plotting and scheming is fine, and the romantic elements were expected given Muv-Luv‘s visual novel origins, but I wished the series would have kept its sense of urgency from the first two episodes and featured more fighting against the invading Beta swarms. I think that would have made the show better. Of course, this was the first season of a continuing story, so things will probably become more urgent and desperate especially if the terrorists have anything to say about it. Moving onto the other elements, the characters were tolerable, but nobody stood out much (except for Tarisa because of her annoying voice). The main pilot Yuuya and Yui had a fun thing going with their ongoing disdain for the other at the beginning of the series, but once we got past that stage Yui became the typical shy and hesitant girl when it comes to her relationship with Yuuya. The other main girl Cryska doesn’t hasn’t shown much of her personality to speak of. The visuals for Total Eclipse were decent. The animation quality seems good as a whole. The mecha and the Betas are CGed, and while they don’t look that great, they don’t look that bad either. I like the mecha designs, while the Betas look kind of funny at first, but the way they eat people up is anything but funny. I have to say, it seems that only the laser types give humans a lot of trouble. After they are taken out the other Betas are helpless against aerial or long range bombardment, and the Betas rely solely on their number to rush and crush opposition. When the real fighting happens, Total Eclipse certainly doesn’t shine away from blood or dismemberment, and those moments were censored in the broadcast version. Overall, the first season of Total Eclipse was okay, but it was not quite what I expected given the start of the series. I would liked to have seen more fighting against the aliens instead of test pilots lounging around having personal issues with one another, but there is still at least another season of the show for the situation to become dire and desperate. I’ll probably watch the next season when it comes out.